Johnny DC « ¡AWW YEAH! Is that title long enough for everyone? Once again I apologize on being late, who knew I’d be spending my week away from classes helping my younger siblings rock out their homework? Moving on. (There’s a vocab list at the bottom of the article. I just realized how much silly terminology I used in this article). This post is simply about book formats. This will be the easiest thing we cover. Seriously, the easiest (I think). The only thing you don’t really want to do is buy a bunch of books on the monthly, unless you’re cash flow positive. It’s just not a smart way to go about it. Now, if you’re already big into comics and are using a service like dcbservice.com to pick up your books this advice isn’t as much for you. There are only a few real benefits to buying a title monthly. 1.) Getting a story in chunks is kind of cool. There is something to be said for the art of telling a story in parts. It also extends your potential enjoyment of the story out months at a time. If you’re reading Wonderful Wizard of Oz one issue a month you get eight months of story from it. In a world where we tend to absorb our media rather quickly this style of story telling forces us to enjoy our stuff like we enjoy Dr. Pepper.It’s a smooth experience. 2.) You can absolutely never be too certain that all the titles that come out in a monthly format will come out in a collected format. It doesn’t matter what they tell you, until it comes out you just can’t be sure. Unless it’s Marvel. Then you have a 98% chance they’re going to trade it. With that out of the way we can talk about collections of comics. To me, this just feels like the best way to go about buying comics. More often than not you don’t have to worry about getting the entire story. It’s going to be in the book you bought. Even if that book is one part of a larger story writers have moved towards making each book work by itself. An important note on trades and graphic novels aimed at kids is they will more often than not come in digest form. The bright side means that these guys are cheap, usually coming it at under ten dollars. I believe the highest I’ve seen a digest go up to is fifteen, and that was a thick thick book. The down side is that the art is definitely squished. Art designed to be ten inches tall condensed to six inches can suffer at times and the lettering can be hard to read. That isn’t always the case, but it is something to look out for. If a book is going to come out in a larger format there is a strong chance you’ll get one of two options for purchasing, either Hardcover or Softcover. Which one you want is purely subjective. Hardcovers cost more and tend to be sturdier, but I find the paperback books to be much more portable and easy to read. The price range on these books will be around the eighteen to twenty five dollar market depending on hard or soft cover and depending on size of the book. So there you have the formats. Digests, Softcovers and Hardcovers. I’ll include a picture for reference later when I figure out where I hid all my digests at. After my last move there’s no telling where those things are. Trade – Short form for “Trade Paperback (TPB).” Trade has also become short form for any kind of collected book be it hardcover, softcover or digest. It can be used as a verb as well (ex. “waiting for them to trade it.” which simply means waiting for the publisher of a book to collect a group of single issues into it’s own book). Sorry about last week. I overextended myself a bit, but we’re back on track. Before we get to the current books I’ll proudly say I’ve read “The Life and Times of Scrooge McDuck” and it’s AWESOME. Really. I’ll write a review for it by July. That’s a promise. Unless I die. Then that won’t happen. I’m pretty sure most kids today have no idea that Donald is actually a world renown super spy. So known in fact that I’m not sure, even he, at times remembers. You really can’t give me enough Arthurian stories. I’ll take about any retelling that I can get. (Well, not Martin Lawrence’ “Black Knight” or Camelot 3000, but just about anything else). This Muppet retelling is actually good. I recommend picking it up. Light week on the wallet for Johnny DC Fanboys. Just one title, at least it’s a great one. This is the current artist’s last issue on the book, and he’s using it to bring back Black Adam. I am thoroughly excited for this. This book is winding down before it’s relaunch later this year and it’s doing so very well. This week’s story is Spidey and the NYPD trying to find Emma Frost. Should be nothing but fun. That’s not sarcasm. This is one of the best books you can be reading right now, All-Ages or no. It’s super good. This is my favorite of the sixteen thousand Wizard of Oz books. 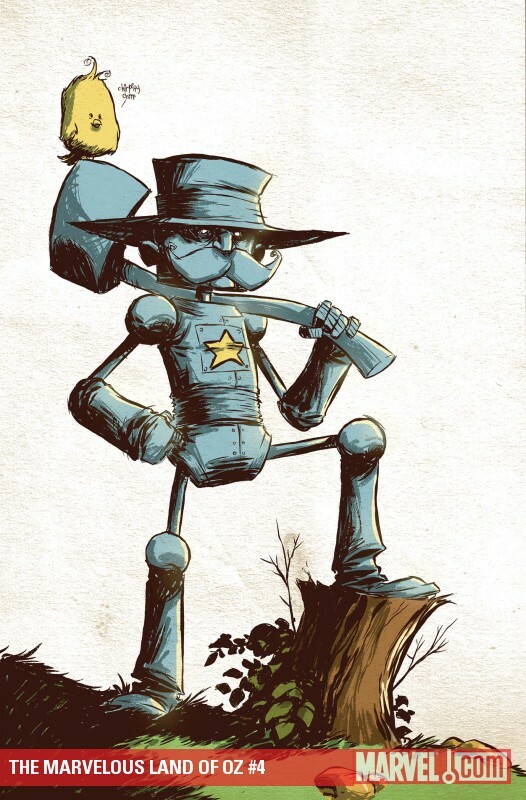 I love seeing what Skottie Young is doing on every page. Before we get to the releases I would just like to issue a small thanks to Boom Kids, who make it the easiest for me to find out which of their books are releasing each week. It’s not the best system in the world, but it’s something. DC is second best because the difference between their Johnny DC titles and Regular titles is very easy to spot going through their weekly releases. The actual DC kids website, however, leaves a lot to be desired. The comics page is just a list of books in alphabetical order. No dates beside anything, just title and issue number. Marvel is the worst. Maybe I just am that old and out of the loop, but that site is impossible to navigate. On the Marvel Kids you would hardly know they produce comic books. There’s a swank button for comics, but when the page loads it’s funny Hulk web comics. I like those, but there’s not any mention of the Marvel Adventure books, or an X-babies, or anything. Currently on the main page there’s a link to view a preview of the upcoming “Marvel Adventures Iron Man #1” but that’s it. That’s enough of me complaining from this week. It’s not all bad. Just could be a little bit better, is all. Big week for these guys as they debut two new series. I am heartened to see that Disney buying Marvel has not put any dents in their relationship with Boom so far. Disney had stated they would keep all current plans in place, but when corporate structures change you can never be too sure. I wonder what these characters getting their own book means for the future of the Walt Disney Comics title and what stories will be told there. More Toy Story tales is fine with me. I’m actually excited for this title. I adore Mickey’s Magic universe. Yeah! A hardcover colleciton of old romantic tales. I don’t believe I’ve ever read any of these. I’m not picking this up this month, but possibly this summer I’ll find it on sale. This is really turning into a Ben 10 Showcase. This month’s issue has two Ben Ten stories in it, with a little Samurai Jack to break it up. What! A retelling of the story of Samson and Delilah with Pepe Le Pew? I’m definitely down. 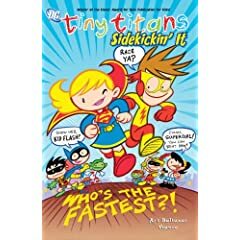 Finally DC is putting out the third collection of “Tiny Titans” named Sidekickin’ It. This will collect issues 13-18 and is a wonderful book for young children. I strongly suggest any of these books to parents with kids just learning how to read. Nada. Play sad trombone right here. 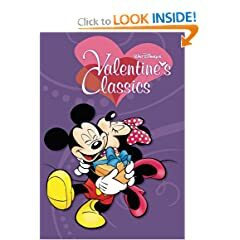 The closest thing I saw was a Marvel Heartbreaker books if you have anyone teens in the house that are particular fans of high school drama and romance stories. That’s it for this week’s releases, stay tuned as I only work a half day on Friday at my real job, and am phoning it in on my second. That means I’ll not only have time to read all the books from this week, but I may even find time to write about them. Maybe? Let’s hope for the best here. Not gonna lie, I’ve totally not been reading this one regularly. I’m sure it’s good as all the other Boom/Disney books are great. Can’t wait to find out what awesome trash Wall-E finds next. This story is set before the movie where Wall-E just chills picking up trash. The last couple of issues have been getting better. Byron Vaughns’ art is starting to fit the title more and more. This is coming down the home stretch for the title’s current implementation and Paul Tobin is wrapping up everything in a nice package. Now comes with X-men. Being old is a lot of work. Jobs, bills, responsibilities, they get you down. So sometimes we want to escape. Nothing works quite as well as watching Black Adam do some very unsavory things to people with whom he has a strong difference of opinion. Being young is a lot of work too. Playing, school, homework, chores, they get you down. So sometimes we want to escape. But watching Dr. Light be nefarious may not work for your brains. Fortunately as dark and angry as some comics get, not all publishers have forgotten one of the shortest groups of readers in comics. More and more publishers are creating books designed with readers of all ages in mind. Boom and DC seem to be putting the most effort behind this, but Marvel isn’t too far behind. I’ll try to keep you as informed and up to date on which books are out and what’s in them as possible, but life happens. I can’t read everything, and it’s not easy to pick up many indie books for me. So, I’m going to do as much as I can to spread the word about these All ages books. I pick up just about everything that comes from Johnny DC. Jann Jones has done a fantastic job re-marketing DC’s kids line to reach an undeserved market. I’m starting to pick up most of the Boom! Kids titles. They’re doing a fantastic job with the Disney licenses they own. Marvel Adventures doesn’t have a huge quantity of titles, but the few they have are quality a majority of the time. I need you to help me out to whatever I miss. Be it an indie title that skipped my radar, or even an issue of a book that isn’t aimed at a younger audience, but would hit it. Just because this blog is going to focus on “all ages” brands doesn’t mean other books won’t shop up here. While I doubt we’ll ever see a vertigo book show up, I will bring up things like Spider-Man love Mary Jane or the DC Raven special as it fits. The beginning ride may be rough here, but stick with me a bit. It’ll get better.